* Tobacco and rum dominate the top – and the room – as it projects strongly. * When I say it projects strongly, you will be leaving a strong scent trail. * The tobacco and rum stay present and gradually get more dirty and animalic as the smell of dirty leather and musk comes in. * It starts to get a little smoky at this point, as if the match for the tobacco has been extinguished in the dirty leather. * As the smoke rises, the heart of sweet resins and earthy patchouli come in with a hint of the rum from the top still in the mix. 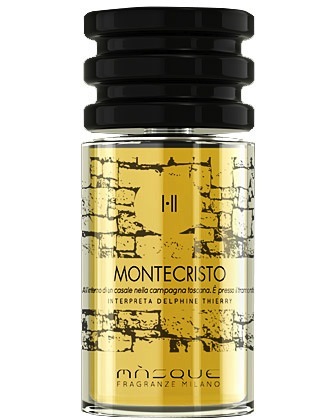 Summary: The buzz on this scent from my fragrance friends has been deafening. Last time I was in NYC, my friend Brian was wearing it, and walking a few steps behind him, I felt like I had to control my urges to throw him down and ravage him. Montecristo is very powerful, primal, and sexual. Obviously not a scent for the office, but for a night of clubbing (or hunting for a partner) this would be a great go-to scent. I supposed a woman could wear this but it feels so virile and masculine, I am not sure how it would work. Longevity is great at more than 12 hours on my skin. It also wears a little differently each time – sometimes it feels dirtier, while other times the rum on the top remains the dominant note. For a good bit of the time in the heart phase, it smells like a used leather satchel used to carry around illicit goods that has absorbed the best of all the elements – well worn, but still very desirable. Masque Milano Montecristo is available from Twisted Lily and LuckyScent. Disclaimer: sample received from fellow perfume lover.. Image courtesy of LuckyScent website.